There are some twists as well, although I’m not sure the author sees the irony in them that I do. Reagan not only was a Democrat in the 1940s and 1950s, but served as Screen Actors Guild president from 1947 to 1952, during which time “[he was a very effective union president…and even organized a famous 1960 actors strike, the first such action in the history of Hollywood” (44). Weinberg mentions instances of Reagan’s personal courtesy that I found oddly touching; for a man whose actions and policies would lead to an interrupted but inevitable decrease in quality of life for the middle and working classes, both during and after his administration, Reagan was, according to this portrait, almost unfailingly dignified and nearly chivalrous, a gentleman who apparently never so much as swore around his wife, who, for her part, was warm and welcoming to all. In a sense, storytelling is this book’s larger topic. 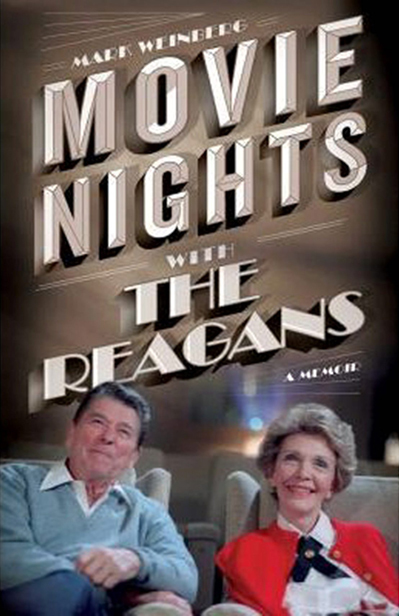 Reagan employed Hollywood storytelling to attain the highest level of public office, treating it like “the greatest and most important stage in the world” (xxiii). To the author, this is commendable; to most of the rest of us, this principle, followed to its present manifestation, is disastrous. If you can tolerate unquestioning acceptance of the politics of Reagan and his ilk (i.e., Margaret Thatcher) and a point of view that the author admits approaches hagiography (246), you will undoubtedly enjoy this book and its unique insights from the intersection of politics, gossip, and royalty, Old and New Hollywood and otherwise. With what we’ve got in the White House at this moment, it might even make you a bit nostalgic. Aesthetically, the book is beautifully typeset, including the title treatment. The title is embossed and varnished on the dust jacket. There are two inserts of rare, behind-the-scenes photos. 288 pp. Simon & Schuster. $28. The book’s release date holds a personal significance for me; February 27 is my Aunt Mary’s birthday. She was a staunch Republican all of my life; about the only things we agreed on were classic movies and food, but that was always enough. Happy Birthday, MRR. I will be going on a long overseas trip next month and this book sounds great to read on the flight. Thanks for writing about it! Thank YOU for reading! Travel safely, Jenni, and let me know your thoughts. This sounds interesting, all of it, from the movie choices to the workings inside the White House. Thanks for recommending! Thank you for reading! That time period was the beginning of so much that we are living with today that really in spite of myself, I went through in one sitting.